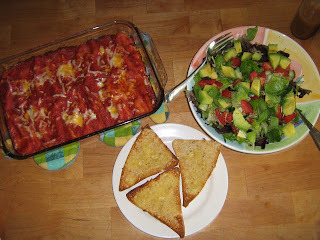 More friends and a blog: What's for dinner? This was our dinner last night. It didn't last long, so either it was incredibly good or the boys were very hungry from running around outside all day. We also have salad, or veggies and dip, most every night. I like us to have as much raw food as possible. The buns have a bit of earth balance with garlic on them and then are toasted in the oven - we are all big eaters and sometimes just need this to fill us up. The salad dressing is made in the blender. It is oil, vinegar, Dijon mustard, dill, garlic, a bit of sweetener, salt, pepper and paprika. Oh.My.Goddess. This looks amazing. I think I can even smell it!! Can't wait to try it. I've never stuffed pasta, but what a GREAT idea! No wonder you go through 50 tomato plants worth of produce each year! I've started about that many now too. WHERE oh WHERE to plant them? ha! Your salad and dressing look amazing too. Thanks so much. 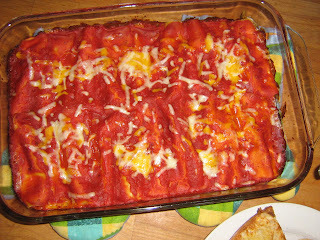 That does look good, and I'm sure I could easily make a vegan version of that with tofu inside the canneloni shells. Maybe the tofu mixture for the lasagne in How it all Vegan would work. You definitely can make this vegan by replacing the ricotta with tofu. That's what I do anyways, when I make manicotti. I saute some veggies and mix them with tofu to stuff the pasta shells with. Like Heather, I'm lucky if there's any leftovers with this dish because it's definitely a favourite with the whole family.